I spent a few hours yesterday gathering more sales for the big list HERE – hope that helps you find some crafty deals! I’ve been asked for a scene card…..so let’s do it! You can certainly stop with the coloring after just the hipster and his little deer, but why not make a suggestion of a scene? And if you know any hipsters – this might be just the perfect stamp set for you….it looks just like my friend Ben! Watch the video below or click HERE to see it in HD on YouTube. 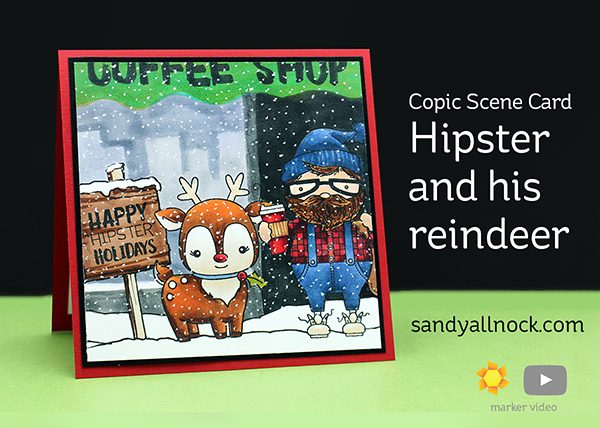 Hope you enjoyed this silly little hipster card – and maybe you know a hipster who needs you to make a card with this little set! Can I close my mouth now? Lol Simply amazing work. What a great artist you are. I always love it when you make a scene and tell a story while you coloring. Thank you for this amazing card. Beautifully captured! Your gift from God is indeed a blessing to those who follow you. Happy Thanksgiving! I love the scene you’ve created. Great card. I do but stamps just for someone because it makes me think of them, but I do many charity cards so I use them again. I made 43 Christmas cards thinking it was enough and then we started addressing them and I need 20 more. Our seems to grow every year. Cutest of the cute! Your Hipster makes me smile! Great card! You totally rocked the hipster look – and since he’s in Portland, of course there would need to be a little precipitation… and a pet.